"Share Information All About Celullar Phone,Phone Specifications,Phone Applications,and Phone Tips"
LG GS500 Cookie Plus With Cartoon UI. LG GS500 phone has a pretty good feature for young people with a Cartoon Like UI (previously been applied by Samsung). Users will see a menu with the format of cartoons, funny sound effects, and cartoon icons. But at the front of the camera so that no users will not be able to make video calls. Also specialized in multimedia features are also very minimal, only accommodate standard media player. This phone also have fourty widgets, which serves to access social networking services like Facebook, Twitter, Bebo, MySpace, and other news services. 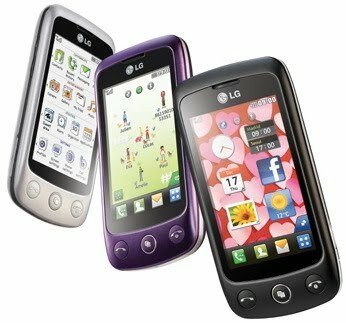 As a complementary feature among others, LG LiveSquare that serves to organize the contacts on the phone. LG GS500 also has been equipped with features web delivery of images via MMS features, document viewer, and multiple email accounts. Network: Quadband GSM, 3G, HSDPA. Dimensions: 10.7 x 5:25 x 1:15 cm. Screen: TFT resistive touchscreen, 256K color, 240 x 400 pixels, 3.0 inches. Camera: 3:15 Megapixel, 2048 x 1536 pixels, video QVGA @ 12fps. External Memory: microSD (TransFlash) Up to 8 GB. Features: SMS, EMS, MMS, Email. Other Features: Flash UI, Accelerometer sensor for UI auto rotate, Handwriting recognition, FM stereo radio with RDS, Games, Java MIDP 2.1, facebook Native client, MP3/WMA/AAC player, MP4/H.263 player, Organizer, Document viewer (Word, Excel, PowerPoint, PDF), Voice memo, T9. halo sobat,thanks uda berkunjung ke blog saya. Salam kenal !! Oh ya,blognya udah saya follow . canggih abis,,, kapan bisa beli ya???? Thank you already will pay a visit here friend, don't forget send criticism and suggestion at comment column in order to this blog can be better. !.. :: Copy My Link Below ::..!